By deciding to shed its Internet business, Yahoo is moving to take on a different business focus amid a rapidly changing online landscape. The move heralds the end of an era for a onetime Internet pioneer. "As an industry, this signifies the end of the static Web," said Patrick Moorhead, an analyst with Moor Insights & Strategy. "Yahoo popularized categories and directories, which was then replaced by search, which is being replaced by mobile. Yahoo completely missed search and entered mobile too slowly. Now it's in flux." Early Wednesday, Yahoo announced that it was reversing its initial plan to spin off its $31 billion stake in Alibaba, the popular Chinese e-commerce company. Instead, Yahoo will keep its Alibaba stake and spin off everything else. The reversal means that Yahoo's core Internet business will be pushed off to a new company. Maynard Webb, chairman of Yahoo's board of directors, noted that the company is not actively looking for buyers for the Internet business, though it is open to offers. But Webb's statement leaves open the possibility that the company will rid itself of its lagging Internet business. "That tells me it's not a strategic directive for the company," said Brad Shimmin, an analyst at Current Analysis. "That business is not going to get investment dollars and certainly won't attract talent. In this industry, that's what it's all about. It's not a vote of confidence. It's not a vote of dedication and strategic interest." Shimmin also noted that Yahoo's decision to hold onto its shares in Alibaba could help it avoid a great tax liability and may indicate that the company has plans to focus on online retailing, with the weight of Alibaba behind the effort. "Yahoo has been making some very strange noises and some odd moves -- from talk of restructuring to executive shakeups -- indicating that it's been unsure about its direction," said Shimmin. "Probably this new move may leave a lot of people scratching their heads, but at least it lends some clarity as to who they are as a company. They are not an online destination for checking your email and sports scores, but an online destination for an ecosystem of sellers, like Amazon." Yahoo was an Internet pioneer. Coming to the forefront of the online explosion 20 years ago, the name Yahoo was synonymous with the then-new world of online search, email, Web surfing and the growth of digital presence. That era of early titans may be over, as Yahoo follows in the footsteps other once-dominant companies like Netscape, AOL and Napster. "This move by Yahoo may be the end of an era," said Jeff Kagan, an independent industry analyst. 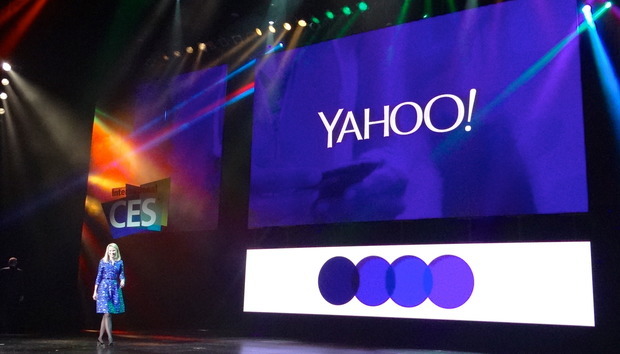 "The next big question is 'What's the future for Yahoo?' There are still more questions than answers, and it'll be that way for a long while to come." One question that was answered on Wednesday morning is that Yahoo CEO Marissa Mayer is not being pushed out. In an interview on CNBC today, Webb said "Absolutely" in response a direct question about whether Mayer would be staying on. He also said, "I've never met anybody who works harder, is smarter and cares more. We want to help her return this company to an iconic place where it belongs." There may be other reasons that Mayer still has her job today, despite failing to deliver the big turnaround that many anticipated. Yahoo simply may not want, or may not be able to afford, to fork over the big money Mayer would get if she were let go. And her departure would be another blow to a company that not only has struggled financially but also had to bear the burden of losing one CEO after another in quick succession. When Mayer came on board in July 2012, she was Yahoo's third CEO in less than a year. That kind of top-level upheaval is disruptive to a company already trying to regain its former prominence and traverse a rocky financial road. "The fact that Mayer is staying says they would like some consistency," said Shimmin. "Yahoo doesn't want to appear to their shareholders that they're junking everything and starting over." So what will become of Yahoo's spunoff Interent business? Moorhead, at least, doesn't have high hopes. "Separating an Alibaba investment from the core business does absolutely nothing to increase its chances," he said. "It wasn't burdened by the Alibaba investment.... To be successful, Yahoo needs a new strategy, one that doesn't go head to head with Google, Apple, Microsoft or Facebook. "Right now, they're playing RC Cola vs. Coke. Yahoo needs to either jump completely over its competitors and attack something different, maybe the second wave of IoT, or do what they're doing in a dramatically different fashion, like open-sourcing everything to create an alternative network." Making that work, according to Moorhead, is not impossible. But it is improbable.